Mare, please send me your snail address and I'll get your tin to you right away. There may be a few surprises in it as well. Thanks to everyone who hopped with us! 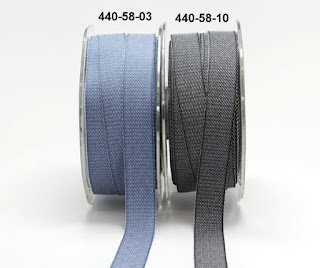 Be sure to check the May Arts Blog for more ribbon inspiration every day. Here we go! 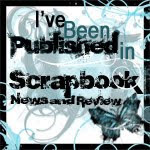 Day 2 of the May Arts/Scor-Pal Blog Hop! I'm first on the hop list today. I've created a quick and easy project to give you a jump on Father's Day. I always find it difficult so shop for the men in my life so thank goodness for gift cards! I hate just putting a gift card in an envelope so I was pretty excited when DH brought home a bunch of these great boxes he found on clearance for...are you ready? 25 cents!! The cool part is that inside is a removable clear insert to hold a gift card or you can pull it out to use for storage or anything else your heart desires. Here's how I transformed mine using May Arts Denim Ribbon, the Authentique Strong paper line (I think this is my new favorite paper!) and the awesome Scor-Tape by Scor-Pal. It sticks to metal better than anything I've found. Starting from the right here's a photo tutorial of how I did it. First, I removed the plastic insert then cut a liner to fit the bottom of the tin. A strip of wide Scor-Tape holds it neatly in place. 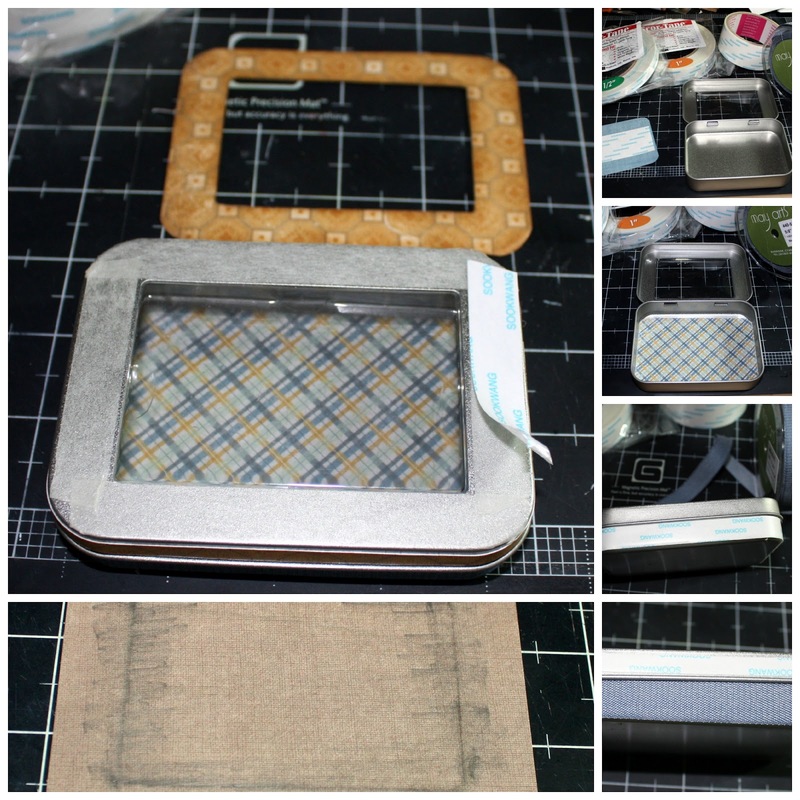 Next, run a strip of 1/2" Scor-Tape around the outside base of the tin, remove the liner and cover with the brand new May Arts 5/8" Denim Ribbon. Repeat around the top with a strip of Authentique cardstock. Here's a tip for creating the window in the top. Cut a piece of designer paper to fit your tin top. Round the corners. Place the designer paper right side DOWN over the top of the tin. Use a pencil to rub along the window frame, then cut out the center with an X-acto knife. Cover the tin top with more Scor-Tape and you have a custom gift box! Instead of a card, I created a tag for Dad. I just covered the front of a manila tag with Scor-Tape then used scraps of my Authentique paper and matching tags from the Strong Circles & Scallop and Stamp Blocks sets. No bows for the Dads here so I made a simple loop and attached it with a custom denim brad made with my Imaginese I-top and a Small Brad Daddie. I think the Dads on my list are going to love it! The tin can be used for change or whatever else men have in their pockets. I taped the Happy Father's Day inside the lid but you could also use a photo of your child or pet. Ok, now it's time for the rest of the hop! 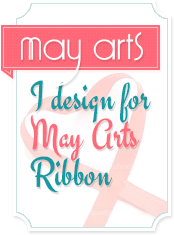 Remember to leave a comment on each blog as you go for a chance to win 3 rolls of May Arts Ribbon (your choice!) and a Scor-Pal. I'm also going to draw a winner from the comments on my blog to win one of these fun tins! Here's your hop list for today. 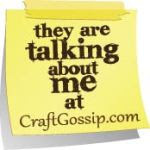 Have fun and thanks for joining us on the May Arts/Scor-Pal Blog Hop!! May Arts and Scor-Pal have teamed up to bring you 2 awesome days of projects and prizes. What do you have to do? 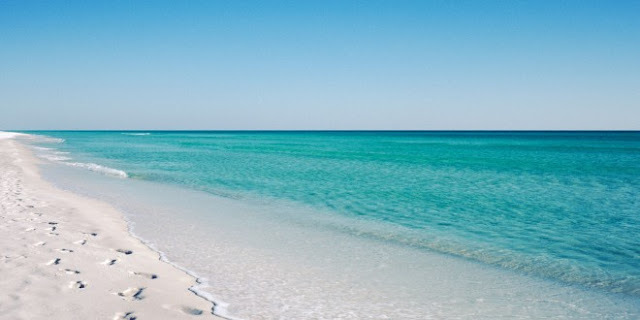 Just hop to each blog and leave some love (comment). We promise there will be inspiration galore! What can you win? Just 3 full spools of May Arts Ribbon (your choice!) and an awesome Scor-Pal. 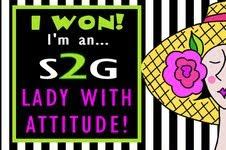 Be sure to visit each blog and comment along the way to win then come back tomorrow for another chance! This week's Teapot Tuesday Challenge destination on SCS (MMTPT251) is a sweet girl named Jessica Francis. Jessica has recently returned from an 8 month missionary where she traveled to 8 different countries working with children. Her mom says children are drawn to her like a magnet. Jessica is tired mentally and physically so we're hoping to cheer her up a bit. I found this children of the world image online and just copied it so make a quick card for Jessica. Since her favorite color is blue, I picked that up as my background. If you'd like to send Jessica a card, you can find her info here. I've got a quick card and gift ensemble on the May Arts Blog today. A fun way to combine a gift and card all in one. No, we're not giving away the beach but the Ribbon Lady is GOING to the beach. While she's away, she's giving away the store...well, almost!! Head over to the May Arts Blog to see how you can win. It's that time again! The Ribbon Lady is calling all May Arts Ribbon Lovers to join the team. Click the photo to find out all the details then get creating! Clean & Simple Monday & Winner Day! This week the SplitcoastStampers Clean & Simple challenge (CAS220) is a Limited Supply challenge. The challenge is to create a card with NO sentiment. Can't get more CAS than that, right? but what a great idea! Vicki, you'll also be receiving this! Just email me your snail address and I'll get it right in the mail to you. It's Wednesday and that means it's time for sneaking a peek at what's happening on workdesks over at Julia's Stamping Ground for WOYWW205. you may have noticed the Ribbon Scrap Giveaway bag has grown considerably in size! I found another bag of scraps while I was doing some organizing so added them to the bounty for some lucky ribbon hoarder, um, I mean collector! You have to leave a comment and follow the directions on this post to get in on the fun. The 13th is coming! Be sure to visit Julia's desk as she's been shopping! Deck cleaning for the next 3 days...ugh! The CAS Challenge on SCS this week (CAS219) is a Featured Stamper challenge featuring the gallery of bon2stamp. I chose this beauty to CASE. I changed up the colors, I still used two ribbons but layered them and I left my embossed panel whole choosing to add a tag for my sentiment. It's the Little Dude's Birthday and you know what that means? The Ribbon Lady is giving away presents! 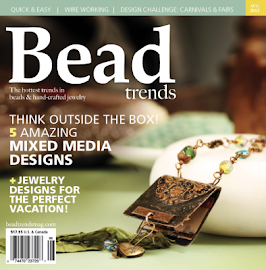 Head on over to the May Arts Blog to get in on the fun. Yay...found time to play in a challenge. 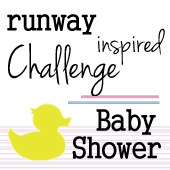 Just love the inspiration for the Runway Inspired Challenge this week. Babies are my soft spot. Thanks for stopping by! Happy Friday!! I was asked by Nick Romer to review his cool product called the "Kreate-a-lope" envelope maker and I can honestly say that it's so fast and easy, it's quite addicting. I've never made my own envelopes before because they seemed too time consuming but Nick's Kreate-a-lope lets you whip them out in just a few SECONDS! It's what's on my desk tonight so I thought I'd share it with my WOYWW friends so you can see how easy it is. I picked my paper, laid the template over it, centering the open square over my design then I just pulled the paper along the edge of the Kreate-a-lope template. I was pleasantly surprised to see how easily it tore and how neat the torn the edges were. Just ever so slightly shabby. The instructions say you can trim them if you want to but I like them as is. You just flip the paper over, place the template on the paper again, place the center template in place, then remove the large template and fold. There's a nifty video here. Easy, peasy, lemon squeezy! Add a little Lick and Stick (this stuff is awesome too!) and you're done! Nick is raising money to make even more sizes of Kreate-a-lopes. He's got a page on Kickstarter so you can get in on the action. AND if you make a donation, he'll send you some free templates. The details are at the link. I think this is a fantastic, well made and economical product! Nick's got some great sample envelopes on the Kickstarter page as well. You can even enlarge photographs and make them into envelopes. Now your cards can have matching envelopes! By the way, I spied some other neat templates on his site for bags and boxes. Gotta go, I've got some shopping to do. Be sure to pop over to Julia's Stamping Ground and see what else is happening on work desks all over the world for WOYWW#204. I've got little giveaway for you too. Remember the scrap bag I told you about here? Well, I'm giving it away. There's everything from full yards to little pieces of lots and lots of May Arts goodness in there. All you have to do is leave a comment on THIS POST and tell me what YOU think of the Kreate-a-lope and follow my blog if you don't already.